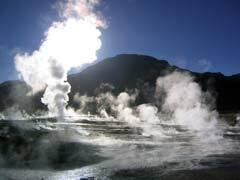 Geothermal energy facts have not received much deserved publicity among other alternative energy sources. Geothermal energy takes its origins from two Greek words, namely, “geo” (earth) and “thermos” (heat), literally meaning “the heat of the earth”. Otherwise poorly used, the heat of the earth could be applied to power generators, heat buildings, greenhouses, and find many more useful applications. Investing in geothermal power stocks allows you to participate in funding development and research of the cleanest and most self-sustainable energy that is not dependent on fluctuating fossil energy prices. Among some geothermal energy disadvantages that must be mentioned before making a decision on geothermal power stocks investment are finding suitable hot spots for drilling, containing dangerous by-product gas leaks, and significant costs associated with actual deep ground drilling. However, multiple advantages of geothermal energy greatly outweigh the disadvantages and help us find clean, self-sustainable alternative energy for generations to come. Some of the most promising geothermal power stocks of the present are with companies developing geothermal technologies in the state of Nevada that are expected to nearly double their production capacity in the coming years. According to Senator Harry Reid form Nevada, this state was referred by him to be the Saudi Arabia of geothermal energy resources. Nevada Geothermal Power Inc. is one of the largest geothermal developers in Nevada and Oregon. The company is known to participate in a number of government incentive programs. In case you find investing in a single geothermal power stock too risky, why not consider investing into one of renewable energy mutual funds that offer great risk diversification opportunities in still developing alternative energy stocks. Investing in alternative energy stocks like, for example, geothermal power stocks is a great investment that can help fund finding clean sources of renewable energy and preserve our planet. The challenge is finding geothermal power stocks that will return significant profits in the future. What Oil Stocks Are Considered Good To Buy Right Now?